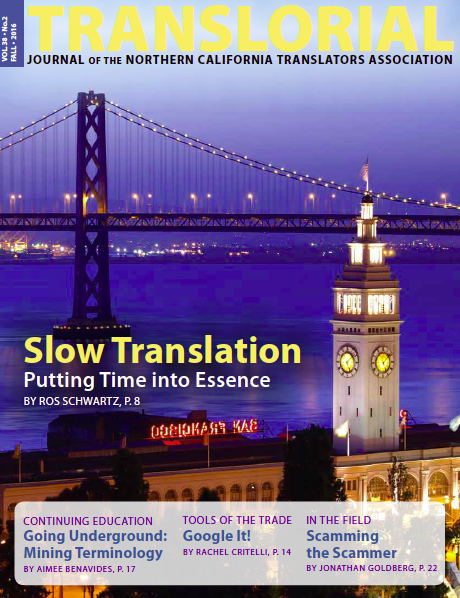 NCTA members can download  the Fall 2016 edition of the Translorial in print and downloadable PDF versions, covering a variety of topics. If you are not an NCTA member, you can join here . NCTA Publications Director Tim Cassidy welcomes ATA conference visitors! The September 10th Northern California Translator’s Association General Meeting hosted Richard Le, Information Professional from the San Francisco Public Library. Long gone are the days of “librarians” who sat behind a counter reading the day away, as are long hours spent in the “stacks” combing through piles of paper. We worked through four topics: (i) translation memory management and translation memory fields; (ii) file type setups; (iii) how to prepare projects, batch tasks, and project packages; and (iv) auto-substitution, auto-localization, and auto-propagation. On Saturday June 11, 2016, NCTA sponsored a great workshop on Spanish mining and geology terminology. really happen a lot?” It does. Many of us receive poorly written e-mails, ostensible “translation inquiries” that hint at real business, but deservedly end up in the trash. Have you ever wondered what would happen if you strung one along and wasted the time and money of an obvious scammer? Our colleague Jonathan Goldberg, Hebrew>English and French>English interpreter and translator, shares his experience.